FRINGE 2.20: Brown Betty – what are you smoking? FRINGE took some chances this week by using one of those oddball “tell me a story” plotlines. In this case, Olivia’s niece Emma begged for a tale from Walter, who had just indulged in a custom-blended pot smoking binge. That combined with his grief over Peter’s disappearance to produce a strange noir that was equal parts Dashiell Hammett, Broadway, The Princess Bride and a pinch of The Wizard of Oz. Olivia was cast as a hard-boiled private eye, hired by a woman named Rachel to find her missing fiancé, Peter Bishop, who has absconded with an artificial heart. The fun came from seeing the twisted versions of familiar faces. The period dress and hairstyles were great. Even stuffy Broyles (Lance Reddick) got in on the fun. I loved the mixture of old cars with cell phones. Walter cast himself as a crippled scientist who invented all the wonderful things in the world (chocolate bars and teddy bears), as well as singing corpses (“Why not bring a little life to the dead?”) – and an artificial, glass heart. Kudos to John Noble and Anna Torv for bravely warbling a couple of tunes – especially after Jasika Nicole (Astrid) showed off her trained pipes. Will and April duet right. Each episode of GLEE since its return has been better than the one before, and this week’s installment, called “Home,” was no exception. A treatise on the concept of finding someplace to belong, the story also saw the welcome return of Kristen Chenoweth as April Rhodes. This was one of those episodes that had viewers laughing, singing along and then crying – sometimes practically all at once. The storyline saw Sue (Jane Lynch) boot the glee club from the auditorium, sending Will (Matthew Morrison) in search of rehearsal space. That quest brought him into contact with April, who was running a roller rink because she got sidetracked on her journey to Branson. April, too, was searching for someplace to belong – was she really happy playing the mistress of a local strip-mall king? When she and Will dueted on “Fire,” it felt like she rediscovered where she belongs: by his side. Morrison’s and Cheno’s voices mesh perfectly, and they look good together, so it was no wonder April wanted to move in with him immediately. (I’m sure Emma would have something to say about that…) Their duet on “One Less Bell to Answer” was heartbreaking. “The Beast Below” is an important story for DOCTOR WHO: It’s the one in which the Matt Smith Doctor takes new companion Amy Pond on their first intentional adventure. 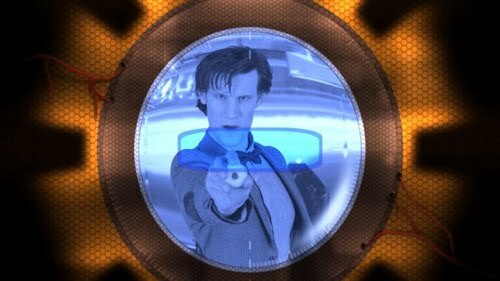 We pick up the story with the Doctor proving to Amy that the TARDIS really does travel in space. The moment is exhilarating – almost as much for the Doctor as his companion. Indeed, it is difficult to tell who is more thrilled. It is a quintessential Doctor moment. The mighty Time Lord has always been utterly fascinated by the little things in life, and despite all his adventures and everything he has seen and done in his 10 previous lives; he is still amazed and overjoyed by the universe. This childlike fascination in a grown man in one of the essential, enduring elements of the Doctor’s personality. And in this, just his second story, we see more indications that Smith is maintain this innocence while layering on a sense of “been there, done that, bought the T-shirt” ennui of an older, experienced person. It’s actually a tough balancing act, playing old/young, and Smith is pulling it off admirably. This is further demonstrated when the Doctor begins babbling about the 29th century and accidentally leaves Amy to float outside the TARDIS. Again, that was such a Doctor moment, because he is quite easily distracted by shiny objects and cool concepts. The Doctor knows stuff – lots of stuff – but it only matters if he can share it with someone. He may occupy himself with knowledge, but he’s certainly not going to impress himself. The next episode of DOCTOR WHO for us in the States is called “Victory of the Daleks.” Here is a link to a set of video previews hosted by the good folks over at Blogtor Who. 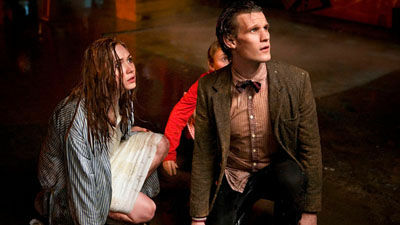 In addition to coming attractions, Matt Smith and Karen Gillan, the Doctor and Amy, do a little intro to the story. STARGATE UNIVERSE asked viewers to go on a journey to two separate potentially ugly places: one was a maze of dark subterranean tunnels inhabited by giant spiders, and the other a thicket of dense memories inside the mind of Dr. Nicholas Rush. You decide which prospect was worse. Rush engaged the Repository of Knowledge, and with Brody’s help, has rigged up a buffer to slow down the flow of information and present it in the form of a semi-lucid dream based on Rush’s own memories. Rush decided to build on remembrances of the time his wife, Gloria, was dying of cancer because he would not mind if those painful memories are destroyed by the Ancient device. Since Rush was essentially having a lucid dream, he understood that his wife was not really dying, and his students were all aspects of his memories. Thus, Rush appeared coldly disinterested in his wife’s slow demise. 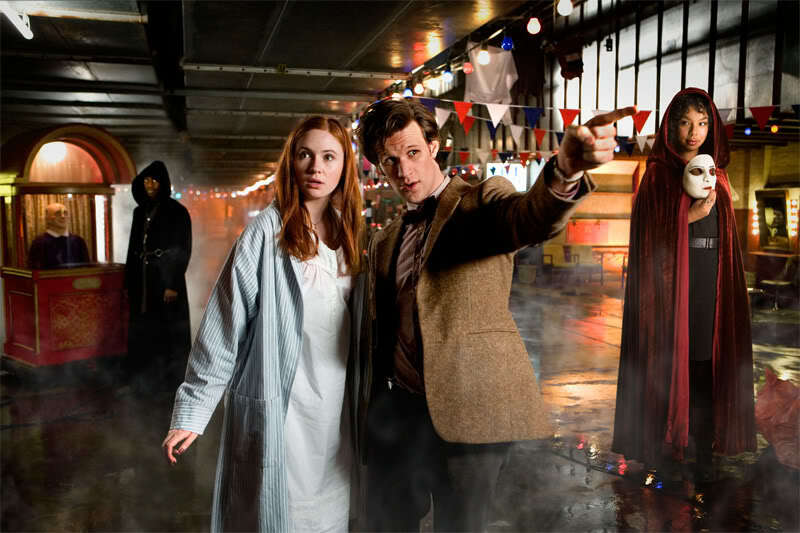 My fellow American DOCTOR WHO fans and I are sadly far behind the U.K. in seeing new episodes of the Matt Smith/Karen Gillan era, however there is one tiny advantage: The sneak-peak and spoiler trail has already been blazed and well-trod! Our soul mates across the pond have done the hard work of locating juicy tidbits about upcoming episodes. Included here is a link to a preview page on the very wonderful Blogtor Who site that contains three teaser clips for “The Beast Below,” the episode that debuts here in the states on Saturday. As a bonus, Steven Moffat himself provides a short introduction! Unless you are a complete spoiler-phobe, I don’t think there’s anything that will ruin your enjoyment of the story. Looks like Amy manages to find a spot of trouble at some kind of creepy/freaky carnival. Just a quick word of caution, however: the rest of the Blogtor Who blog, while excellent, contains lots of spoiler material, so be careful while wandering around. Remember, they are a couple of weeks ahead of the USA, so it’s not their fault they already have reviews of episodes we Yanks are just salivating at seeing! THE A-TEAM’s Hannibal Smith famously loved it when a plan came together, and LOST the-powers-that-be reunited key characters this week as they position their players for the endgame. And that made longtime viewers the winners this week.